The new nanoparticles, developed by Zibiao Li from the A*STAR Institute of Materials Research and Engineering and his collaborators, are a significant upgrade from previous generations of polymer-based drug delivery nanoparticles. Early examples typically consisted of simple polymer chains with a polar, hydrophilic head and a non-polar, hydrophobic tail. In water, these chains naturally aggregate into spheres, with their hydrophobic tails all pointing inward to form a non-polar core. The core formed a good site for drug molecules to nestle. In the bloodstream, however, these aggregates tend to be torn apart. Li and his colleagues used the latest polymer synthesis techniques to create single-molecule nanoparticles. Rather than a self-assembled aggregate of separate polymers, the team synthesized a more robust structure in which the polymer chains were strongly covalently bonded to a central core. The synthesis began with beta-cyclodextrin, a circular sugar molecule with 21 hydroxyl groups on its surface. The hydroxyl groups formed the chemical anchors from which the team constructed the nanoparticle's multiple long, Y-shaped, multifunctional polymer arms. "The greatest challenge in making the [nanoparticle] was to integrate different synthetic methodologies into one macromolecular design," says Li. At one of the ends of each Y-shaped branch, the team attached a temperature-sensitive polymer called PNIPAM. 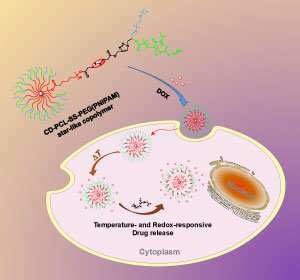 At room temperature the PNIPAM polymer extends outward, but collapses once body temperature, 37 degrees Celsius, is reached, allowing the nanoparticle's drug molecule cargo to escape. Mid-way along each polymer arm, the team installed a sulfur-sulfur bond. When the particles enter a cell, they meet high levels of glutathione, a molecule that cleaves sulfur-sulfur bonds. Thus the nanoparticle's outer polymer coat is snipped off, and the drug is released even faster. When the team tested this effect with an anti-cancer drug called doxorubicin, the dual-action effect was clear. "The change from room temperature to body temperature, and the effect of glutathione, showed synergistic and fast release of the drug," Li says. At lower temperatures, or in the absence of glutathione, drug release was significantly slower, he says. "The next plan is to integrate new functionality, for precision release of the drug for targeted cancer therapy," says Li. One end of each Y-shaped branch could be functionalized with a molecule that sticks selectively to cancer cells, delivering the drug precisely where it is needed.